Over the last few months, both the Victorian and NSW governments have been considering a cull on the number of wild horses in the Kosciuszko and Alpine national parks. While NSW is proposing a cull of horses from the current population of 6000 down to 600 over the next 10-20 years, the Victorian government reckons there are some 2300 wild horses in the eastern section of the Victorian Alps and less than a 100 on the Bogong High Plains (both well down on previous estimates); in Victoria, no figures were given for what would be an acceptable number after the cull, or how long the cull would take place for. Still, I reckon we gotta start somewhere and a cull of any number of wild horses in our high country is not only necessary but imperative, in my opinion! They are often called brumbies but I’m not even sure ‘wild horses’ is the best term for these animals. Really, they are feral animals introduced by humans in the last 150 years or so. Maybe we should call them ‘feral horses’ as the terms ‘brumby’ and ‘wild horse’ tend to have romantic connotations more closely linked with the Man from Snowy River legend than anything else. Now, I’m not a great lover of shooting feral horses, or whatever you want to call them but, without action, we’ll see an increase in population until a drought or other natural disaster comes along, when the horses will die – rather cruelly, one would think – in their hundreds. Aerial counts conducted by Parks Victoria estimate the population is expanding about 10 per cent a year, and these ever-increasing numbers will create untold damage to the alpine environment. We have got to manage them! However, the Australian Brumby Alliance president Jill Pickering was strongly opposed saying, “...aerial culling in treed areas such as the alpine area cannot be done humanely”. I’m not so sure about that. In the Northern Territory, where wild horse numbers are in plague proportions in some areas, Parks and Wildlife NT has done a study on the killing of horses and has concluded that aerial culling is the most humane method of control, according to a news story published on ABC Rural in 2013. (See www.abc.net.au/news/2013-08-13/animal-welfare-horse-culling/4873726). On Cape York, south of Weipa, wild horse are an huge environmental problem, wrecking the beaches and the swamps in the area. 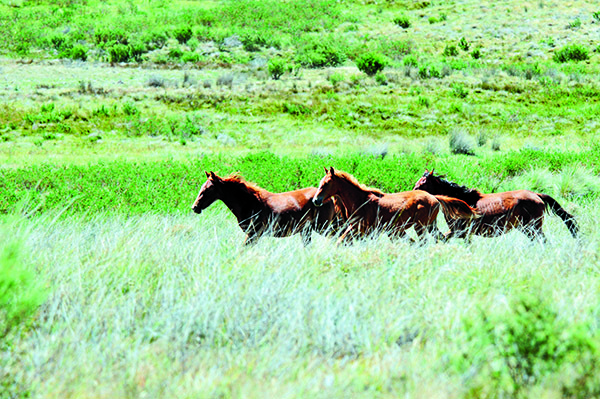 Culling from helicopters has seen thousands of horses (and pigs) killed over the last few years, in a well treed region. I gotta say that aerial culling is, in my opinion, the only practical way of eliminating most of the feral horses in the high country – whether in NSW or in Victoria. While Victoria will continue to allow brumby running and roping for the capture of feral horses, and may even consider aerial shooting, NSW will not, preferring to use trapping and mustering to help control numbers. Although the aerial shooting of horses has been completely ruled out in NSW, ground shooting is still on the agenda! I’m not advocating the wholesale destruction of wild horses across Australia. But, we have to do something to protect our native flora and fauna from the ever-increasing numbers of wild horses – wherever they are.